The Gaurs returned to winning ways after three games and climbed back into the playoff places. Jamshedpur started the match positively but it was Goa who took the lead somewhat against the run of play. 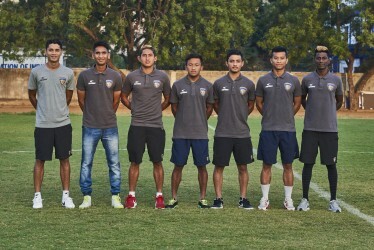 The Gaurs’ head coach Sergio Lobera though insisted that his team were deserving winners on the night. “There were games where we were better but weren’t able to win. In today’s game we suffered quite a bit but a team needs to know how to win. Today the team learnt to suffer and how to play against a team that was hard to play against,” he told reporters at the post-match press conference. The match was also marred with an altercation between both set of players at half-time but Lobera was keen to play down the incident. “Ultimately, what happens on the pitch should stay on the pitch. This is a league where the players know each other quite well. It’s a very sporting league as well. It moved to a point where things just boiled over,” the Spaniard said. The 40-year-old concluded the media interaction by defending his midfield general Ahmed Jahouh who was booked for persistent fouling. “Jahouh is a player who’s got a yellow card before. I‘ve coached him before. I know he’s a player who can handle a yellow card. He took it up to the limit but he knew where the boundaries were,” Lobera said. Steve Coppell believed that his men deserved points from the encounter. “Overall I thought we deserved the points. In the first half an hour, we stopped them from doing what they do and we had a couple of opportunities. I thought it would’ve been good if we would have taken advantage then. They’re a good side but I look at my team. If we play with the same desire and will to win, we’ll be alright,” he said. 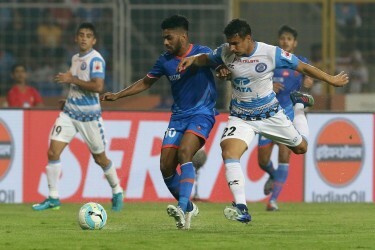 Renowned for having the best defensive unit this season, Jamshedpur’s solid backline has been breached four times in their last two matches, but the 62-year old does not read too much into it. “I knew we wouldn’t go throughout the season with clean sheets every week. But do I want to stay on the back foot for 18 games? No. We want to be on the front foot so that leaves more spaces at the back. So, say we conceded two goals but I say we conceded one goal. The score might say otherwise,” he said. Before leaving, Coppell praised Lanzarote whose brace proved to be the difference at the end of 90 minutes. “(He is a) terrific player! You look at his record, his goals today. Both the teams got some quality players. Coro (Ferran Corominas), (Ahmed) Jahouh and the triangle in midfield, which a lot of teams will try to negate. Super finish (for the second goal)! You can’t question his ability,” he concluded.